We actually have enjoyed this much anticipated event for several years! Our first time to attend was 18 years ago when our 3rd was 7 months old. 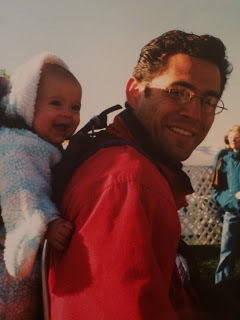 I still remember her all bundled up just staring at the balloons in awe. Our 2 little boys, Jacob & Ethan, were not much different! Seeing the sky filled with all the amazing shapes and colors had each of them hypnotized! At that moment 18 years ago we would never have dreamed we were going to be hosting others in our bed and breakfast as they got their first opportunity to see this beautiful array of colors in the sky. As always I am so excited to meet all the amazing people that have chosen to share this time with us and meet them and listen to all their great stories. Also we are really looking forward to sharing some great food and conversation with each person. One of the things we love to share with our guests during this time is our fresh made breakfast burritos. These are the perfect breakfast food for an early morning trip to the balloon park. 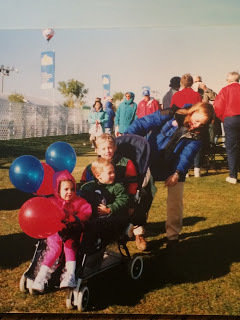 I would also like to share with you some of our fun “Balloon Fiesta” pictures from our early years as a young family at the event! Abbey is 5 months old, Hannah 2, Ethan 4, Jacob 6. All were so excited about this huge sky full of color! This entry was posted in Uncategorized and tagged About Innkeepers by admin. Bookmark the permalink.